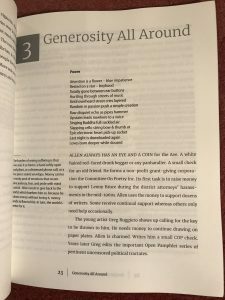 There have been a number of recent Beat books of late and our imprimatur of “essential reading” might seem a little easily dispensed and perfunctory – but no, not for this one, not so. This one is essential reading. 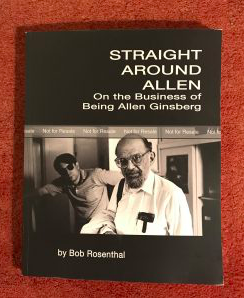 Bob Rosenthal’s Straight Around Allen – On The Business of Being Allen Ginsberg has long been anticipated and eagerly awaited, and it has, we’re happy to report, finally arrived! Bob was Allen’s secretary and trusted friend and confidant for over twenty years, his “right-hand man” (until Allen’s death in 1997). A calm presence in a far-from-calm vortex (Allen seemed to thrive on chaos, as Bob astutely observes). No one was closer to the day-to-day, no one more patient and comprehending. “Written straight from the heart, Bob’s book will survive as an invaluable companion to Allen Ginsberg’s poetry”, Beat scholar, Ann Charters, accurately, remarks. “Candor ends paranoia”, Allen famously declared, and Bob seems to have taken that teaching (and a parallel teaching of close attention) without malice, and indeed with a leavening sense of humor. 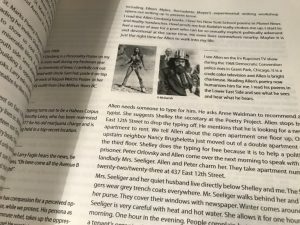 Straight Around Allen is a book rich in anecdotes (and they are anecdotes you won’t find anywhere else). His assesment of Allen is sympathetic, in the deepest way. It’s a true portrait, thoughtful, even-handed (he is no less critical of his own poet/self). The book is unique, sui generis, like they say. It’s not just (mercifully!) 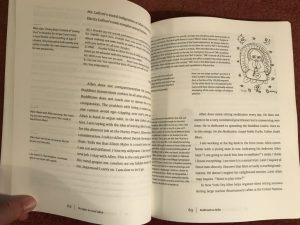 another “standard step-by-step biography” – the visual engagement (merely hinted at in the images above), the varying fonts, the book’s design, (ably rendered by the publishers, Beatdom), make for a kaleidoscopic lively engaging view. We learn much about Bob, we learn much about ourselves. This book is a must for all Beat libraries. Don’t miss this peregrination around Allen. Elsewhere on The Allen Ginsberg Project – here’s Bob on the radio in 2011 talking about Allen. The following year, he talked with Michael Limnios on Blues.Gr. and Daniel Maurer.